Ambulatory surgical procedures—also referred to as outpatient or same, day surgery—can be completed without an overnight hospital stay. This practical, cost-effective alternative is appropriate when your surgery is not an emergency and can be planned in advance with your physician. You will be discharged the same day to recuperate in the comfort of your own home. 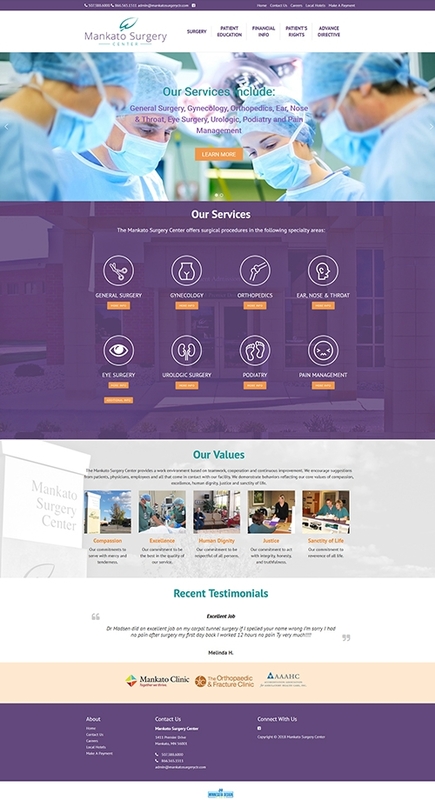 The Mankato Surgery Center is a freestanding outpatient surgery center located at the Wickersham Health Campus. The 16,000 square-foot Surgery Center is the first of its kind in southern Minnesota. It includes four surgery suites for same-day surgery and two procedure rooms. Mankato Surgery Center is a smoke-free campus. We ask that you refrain from the use of tobacco while you are here. Our primary concern is you—our patient. Our professional and supportive staff continually focuses on a high level of professional attention for you and your needs. Be assured that while you are in our care, you will be treated with compassion. We will respect your privacy, fears and your need for information and reassurance. Any questions regarding the events surrounding your surgery or stay with us are welcome. This entry was posted in Website Design on February 12, 2018 by Ross Lund.